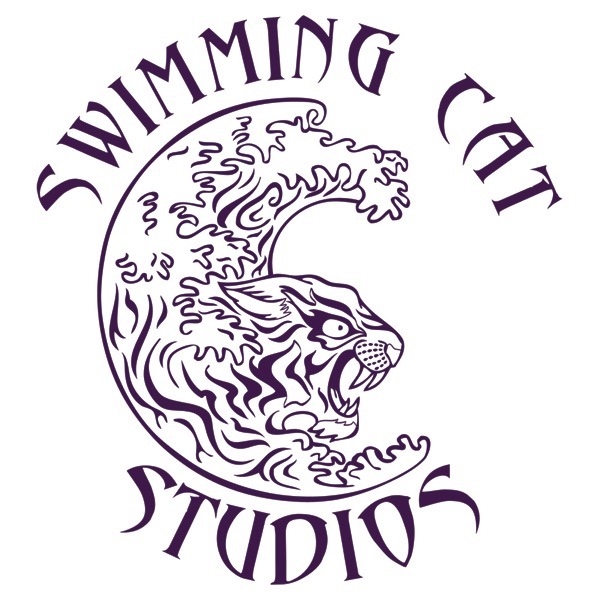 At long last, we finally have a logo for Swimming Cat Studios. For those of you who have been looking at the “Logo coming soon” message up on DocColeman.com and on the Swimming Cat Studios Facebook page, this will surely come as good news. I’ve been working off and on with artist and author Helen Madden, aka Cynical Woman, for over a year now, ever since Balticon 45. In fact, her insights have done a lot to help me shape the current design of the site. For those who haven’t caught on, Swimming Cat Studios is named in the homage of an old Heinlein quote relating to learning a skill by doing it. i.e. Learning it “the way the cat learned to swim”. While this is a picturesque phrase, and somewhat evocative, I wasn’t really going to throw a cat into a pool to get a signature image. I discussed this with Helen, and she was the one who pointed out that tigers swim. I love tigers. They’re pretty much my favorite of the big cats. So I quickly had a theme for the site, and Helen had some ideas to begin working on the logo. Over the months, Helen and I traded ideas back and forth, with some delays while Helen worked on other paying gigs, and hustling Girl Scout cookies. And then there was the search for a font. I never realized how much people, read *I*, take fonts for granted until I had to choose a font for a logo and make sure that the rights to use that font were secured. We see so many different fonts every day, that we tend to forget that someone had to work at designing those type faces, and that work is copyrightable. Some fonts are public domain. Anyone can use those, and most of what you see on the web is text rendered in these public domain fonts. Some fonts are available for personal use, but require a licensing fee for commercial use. And then there are premium fonts that you pay for the right to use. Some of these are very expensive, and some are quite reasonable. It can be a real project to find a font that looks good and represents the look you want for your site. That is something that is really important in a logo. If you have an artistic bent and have a good idea of what you want, it may just be easier to draw the letters for the logo, rather than getting a complete font. This works if you only want those letters for the logo and aren’t going to use them anywhere else. Unfortunately, I didn’t have a clear image of what I wanted my lettering to look like, and I wanted more flexibility for future graphics. So, it was a font search for me. Then, when it came to acquiring rights to the font, we ran into another snag. The company that owns the rights to the font appears to have dissolved. We made repeated efforts to contact them and pay the licensing fee, but all of our attempts bounced. We made a good faith effort. 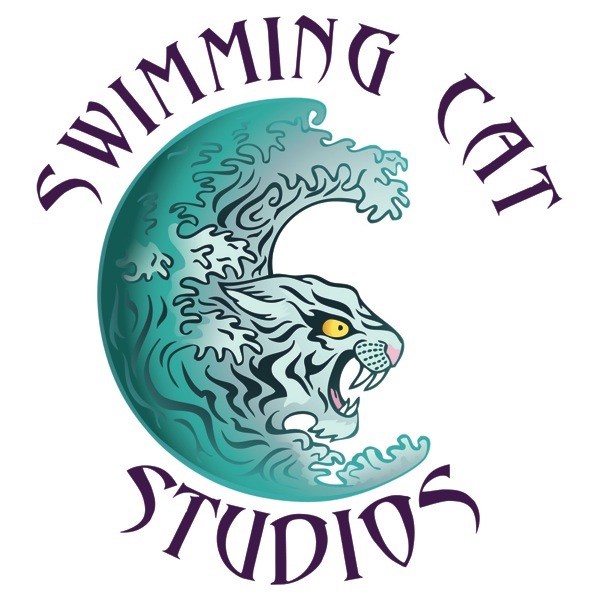 We weren’t really sure if we needed to license use of the font, seeing as Swimming Cat Studios really skirts the line between personal and commercial use. Right now, it is pretty much a personal site, but eventually I do hope to be able to use it to sell my writing and to pick up paying voice acting contracts. Someday we may even do paid audio work. Fingers crossed. But so far, all the support for the site is pretty much coming out of my pocket. Having done our due diligence in selecting the font, we pressed on, and Helen came up with this really wonderful line art for the logo. I’m not a tattoo person, but this design is cool enough to tempt me to get a tattoo. It has a very cool tribal feel to it. Still thinking about it. I hope you’ll agree with me that Helen did a fantastic job on these logos. There will be some changes to the site in the next few weeks as I integrate the logos into the existing layout. Please let us know what you think! Hi Doc. I am writing on behalf of a swim team from Savannah, GA. Our team name is Georgia Coastal Aquatic Team, aka, GCAT. Every year we give each of the swimmers a small pin commemorating the season. Last year we had a paw print and GCAT swimming. I just googled “swimming cat logo” and nearly fell out of my chair when your logo came up. Would it be possible for us to use your art work on our pin this year. We order approx 200 lapel pins and give them to our swimmers. We do not sell them. It would only be used on the pin. We have a logo so I am not asking to use it as a logo. Thank you for taking the time to read this! If you want to look at our website, it is http://www.gcatswim.com. I’m sorry for the delay in responding to you. Life has gotten in the way of many things. Thank you for the compliment to my logo and the artwork. Unfortunately, the logo and the associated artwork are part of the branding of my company. To allow them to be used elsewhere would dilute my brand. It is tough enough to gain notice as an independent author. I’m sorry I can’t help. I hope you were able to find other suitable artwork. Previous post: Another year has been vanquished! Next post: Great is the enemy of Good.